Baskets are the perfect welcoming accessory for any home. 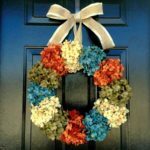 Can there anything be more beautiful than a charming wreath on the front door? 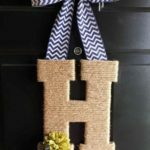 While the answer is ‘no’, sometimes you still want something different and spruce up the door with something new and fresh. 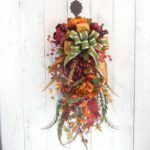 Plus, if it’s in the midst of changing out your seasonal wreaths, you need an easy but incredibly beautiful décor item that will make a huge impact on your front door. 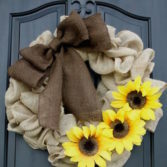 And, flower baskets can be that décor item to beautify your front door or the mantel. 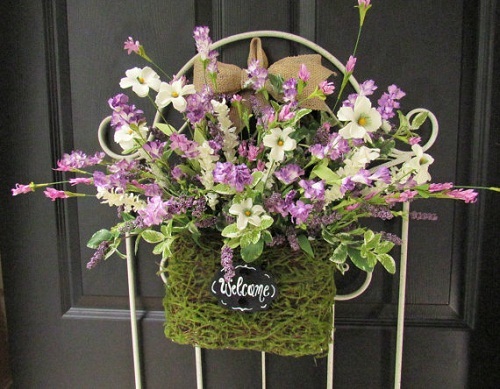 Greet guests with a gorgeous basket of flowers! Either leave the tote bag natural or brush it with white acrylic paint or any color you like. Bright colors will give it a sprightly summer look while the white paint will lend it a bit French-flea market looking. Cut one handle of the tote bag or fold it inside the bag and attach with glue. Thus, it’s now left with one handle that’ll serve as the hanger. Fold the stems the length you need instead of cutting them down. In this way, you can re-use the flowers for other future projects. Layer the flowers and place them inside the bag. Add a few sticks of faux greenery as the finishing touch. You can try different combinations, colors, and shapes as it will create a more interesting look. Pull and bend the flowers either to bring them forward or to push to the back to get your desired look. Now, hang the flower basket on the door with the handle. If you want, make a small bow with the ribbon and attach it to the front side of the bag with a stack pin. Use various colors and combinations to make the look more interesting. 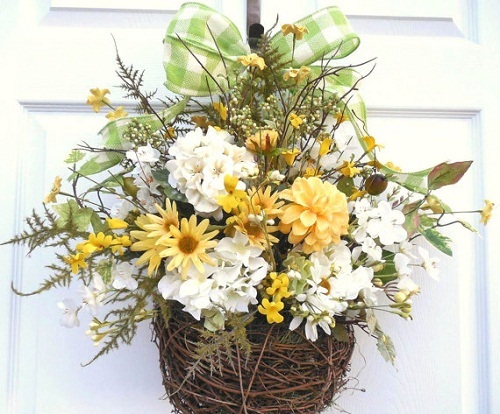 Want the look of these floral baskets for your front door? Etsy Owner – Chickadee Lore has a great selection! Visit her Etsy shop here. Instead of tote bag and single flower stems, you can use small storage baskets and flower bouquet for making this craft. Glue the bottom of 3 or 4 glass jars and place them inside the basket. Now, put the bouquets inside the jars and see how pretty they look! If you use bouquets of fresh flowers, put small amount of water inside the jars before placing the flowers. 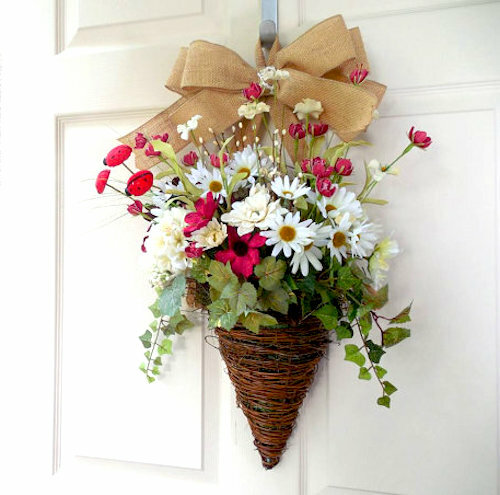 Flower door baskets are a simply beautiful craft to try if you are looking for good wreath substitutes. Using faux flowers for this craft is practical but fresh flowers and foliage are also fine as they will lend the baskets an absolutely gorgeous look. 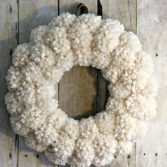 For more floral wreath ideas, visit our wedding wreaths category! 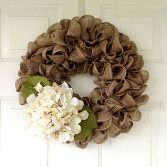 Your burlap wreath and basket designs are beautiful! I enjoyed seeing them all, they are an inspiration! Beautiful! Thanks for linking up to Merry Monday! Pinned! Have a great week! 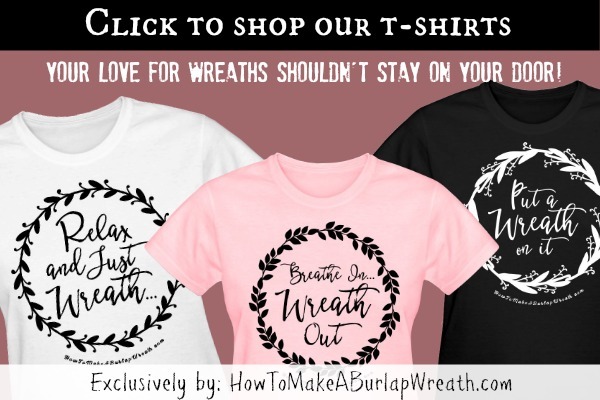 The wreath ideas are absolutely gorgeous! Thanks for sharing them at Work it Wednesday! All these designs are absolutely beautiful and they look like so much fun to make. I’d love these at home! Love Love Love this idea! So unique and pretty! The wreath is beautiful! 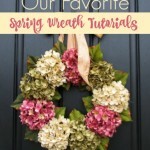 Have always loved the idea of using baskets in wreath making. Beautiful flowers. Thank you for linking them up at the create link inspire party. I love them and shared them in a round up today. I love all the ideas. Thanks for sharing with us all.